We offer a large range of lifestyle, leisure and interest Groups; whether you have a specific interest or a passion to try new things. We promote independence, and we understand that social engagement, recreation and leisure is an important element of maintaining a healthy mind and positive quality of life. Have fun interacting with others in a comfortable, home-like environment. The John Green Centre also provides those who care for a loved one with an opportunity for daytime respite. There’s always something novel and exciting to do at the centre, and participation in activities is always at your comfort level. What about being able to make new friends? and so many more we are unable to list them all! This group is provided to support people over 65 who would like to spend time outdoors potting plants and vegetables. This group is provided to support young adults living with a disability. This group is provided to support people over the age of 65 who are looking to develop new or maintain their cooking skills. You even get to take home any leftovers! This program is on every Wednesday at the John Green Centre. We focus on what you can do and not what you may not be able to do. The Endeavour Club is a place to relax, have fun, do things you have done before and try new things. We have a safe place where you can be your best, you can feed your spirit. It is a place where you can share your thoughts and set fire to your imagination. We aim to help ignite lost memories and awaken dormant abilities. Our program does not focus on the activity, we focus on bringing out the best in you. We support you to be a part of a team and to find a task or role that gives you joy. You will leave feeling content and with a spark of happiness shining in your eyes. Join one of our Thrifty Shopping Groups and enjoy socialising with others whilst enjoying and day out speciality shopping or sampling the best beverages and cakes that our local communities have to offer. We also pick you up and return you to your home. Find out if we service your area, and where your closest group is. Love to explore? Become an Out & About member! 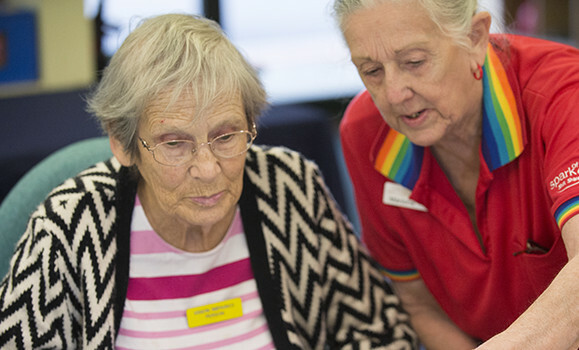 Members are active participants and seniors who come from many different walks of life but all with similar goals: to socialise, make friends, visit interesting places and enjoy themselves. Members currently range in age from their 40s to late 90s. Everyone in the group has input into activities and locations with the support of a programme planner. SDS helps facilitate a number of groups, fortnightly on Friday and Saturday evenings, for individuals that would like to get together and collaborate. There are seven groups, made up of young men and women of similar interests who enjoy spending time together. SDS supports our clients to achieve their goals whilst having a great time. The program is planned in consultation with participants and they are able to communicate and interact between outings as each group has their own safe and private Facebook group. Would you like to take a short trip away? SDS can assist you with this and help you to create memories that will last a lifetime. Groups can choose where they would like to go and which one of our fantastic support staff gets to with them. This gives the families of our adventurous travellers an opportunity to rest and relax, secure in the knowledge that their loved one is having a fantastic time. Short Breaks are holidays designed specifically for groups of likeminded people with disability aged between 18 and 64. Although we can organise trips for people over the age of 65 as well. Where should we go to next? We have only one condition our intrepid sightseers must return with as many photos as possible! Popcorn, pizza and a photo slide show is a post-holiday tradition that is not to be missed!